Sunday October 29th 1893 It was bright this morning and Will and I took a ride. I got dinner after I came home. Mrs Fuller ate with us. We went over home in the afternoon and in the evening to church. There was a special of the Republican issued this morning announcing that Mayor Carter Harrison of Chicago was shot dead in his own door last night. 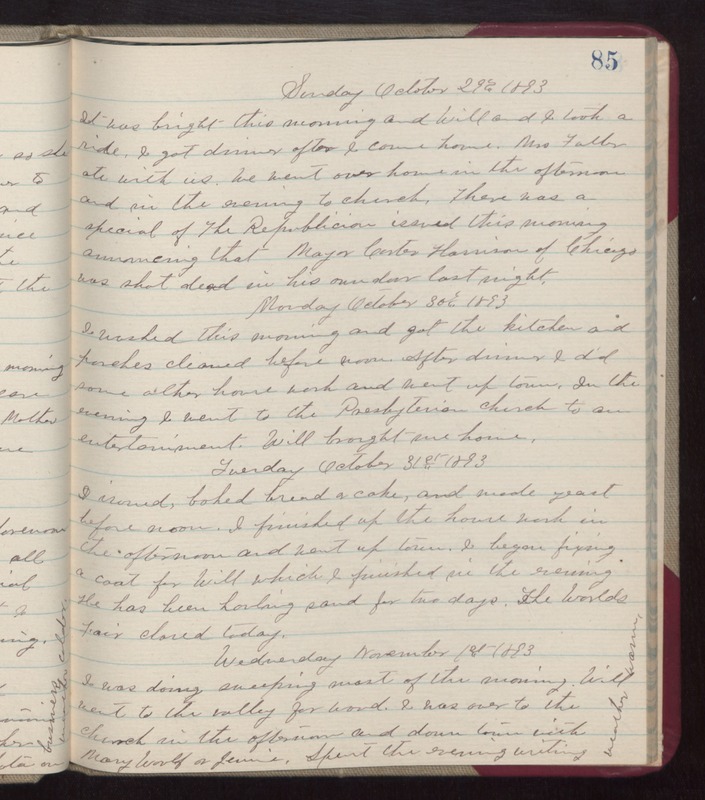 Monday October 30th 1893 I washed this morning and got the kitchen and porches cleaned before noon. After dinner I did some other house work and went up town. In the evening I went to the Presbyterian church to an entertainment. Will brought me home. Tuesday October 31st 1893 I ironed, baked bread, a cake, and made yeast before noon. I finished up the house work in the afternoon and went up town. I began fixing a coat for Will which I finished in the evening. he has been hauling sand for two days. The Worlds Fair closed today. Wednesday November 1st 1893 I was doing sweeping most of the morning. Will went to the valley for wood. I was over to the church in the afternoon and down with Mary Woolf & Jennie. Spent the evening writing. weather warmer.